Narragansett Bay National Estuarine Research Reserve: Real-time and archive data (real-time – select station NARTBWQ). 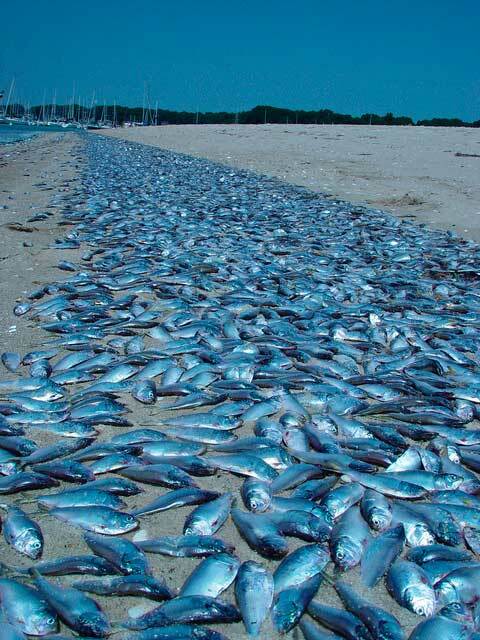 On the morning of August 20, 2003, tens of thousands of dead fish were reported washed up on the shore or floating on the surface of Greenwich Bay. By noon, that number had swelled to one million. While fish kills are not a particularly rare event in Narragansett Bay, this event was likely the largest in 50-100 years, and the sight and smell of one million dead fish had a lasting impact on residents and policymakers alike. While fish kills are sometimes caused by fish disease or toxic chemicals, the most common cause is hypoxia, and the conditions in Greenwich Bay in August 2003 were near perfect for low oxygen levels. It was hot, rainy year, and wind and water flow conditions in Greenwich Bay led to low mixing of oxygen into bottom waters. The conspicuous event on August 20 killed juvenile Menhaden, crabs, and American eels, but low-oxygen conditions in the weeks before August 20 also killed a large number of soft-shell clams. Dead menhaden washed ashore in Greenwich Bay following a hypoxic event. Photo courtesy of RIDEM. Many Rhode Islanders demanded action to prevent future fish kills, and the RI General Assembly enacted a law directing the RI Department of Environmental Management to reduce the nitrogen loading to Narragansett Bay by 50%, as nitrogen is the most important nutrient contributing to hypoxia in Narragansett Bay. RIDEM’s plan focused on 11 wastewater treatment facilities in the upper bay area as the most significant point sources of nitrogen. Nitrogen reduction technology has been, and continues to be, installed at these facilities and nutrient loadings are decreasing as upgrades become operational. By 2014, nitrogen loading from facilities decreased by 65% from 2003 levels; however, nutrients and dissolved oxygen in Narragansett Bay continue to be a concern, and indeed Rhode Island saw two, smaller, fish kills in 2015. Continuing to monitor dissolved oxygen is essential to evaluating the efficacy of these investments and regulatory policies.